My slice of the world experienced a partial solar eclipse yesterday, and it was pretty neat. If I'd traveled a couple hundred miles northeastish I could've seen a full annular eclipse, which you might recall is when the Moon is a bit too distant to completely cover the Sun but instead leaves a "ring of fire" circle of sunlight around the lunar shadow. Or I could experience a 91% eclipse at home. Tough choice. Although my house is blanketed in shadows in the late afternoon, our across-the-street neighbors Larry and Mary had a perfect view. Larry and Mary are about the best neighbors ever. I wouldn't ask them to help me bury a body, since they're both former FBI, but anything short of that I'm confident they'd have our backs. They didn't bat an eye when Karen called yesterday to inform them we were having an Eclipse Party in their front yard and they were welcome to come. They pulled out their lawn furniture, we grilled some chicken-apple sausages, everybody brought wine. 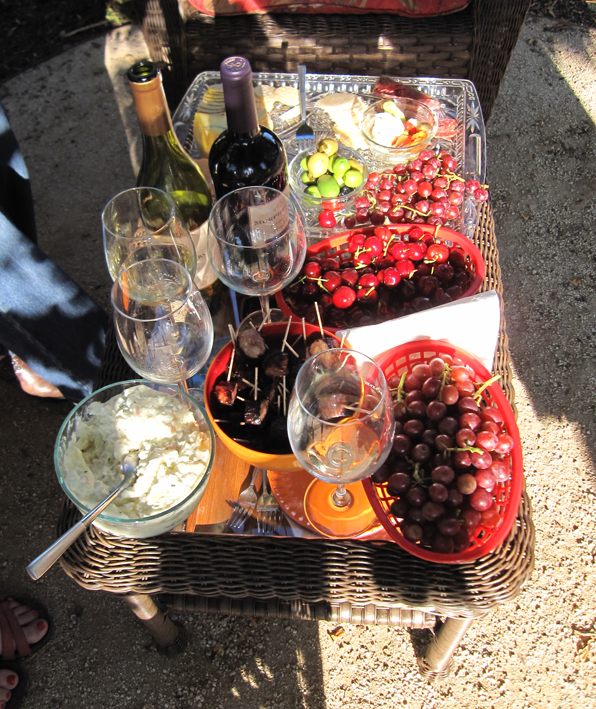 California Eclipse Party essentials: grilled sausage, potato salad, cherries, grapes, cheese, crackers, olives and other pickled things, red and white wine. Sun optional. 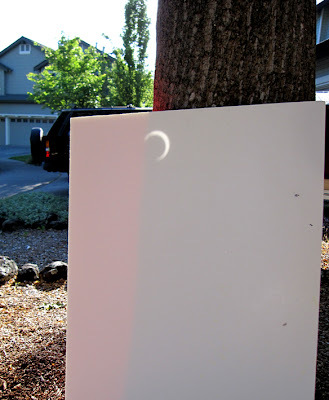 ...white poster board, which made it very easy to sit nearby and watch the eclipse happen LIVE without actually staring stupidly into the Sun. 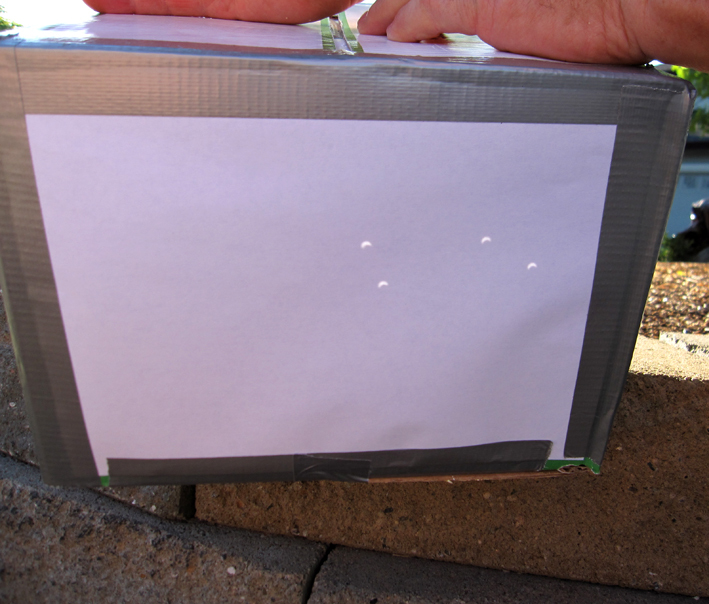 The second telescope was that empty box above, which I taped up and then cut holes into its opposite ends. 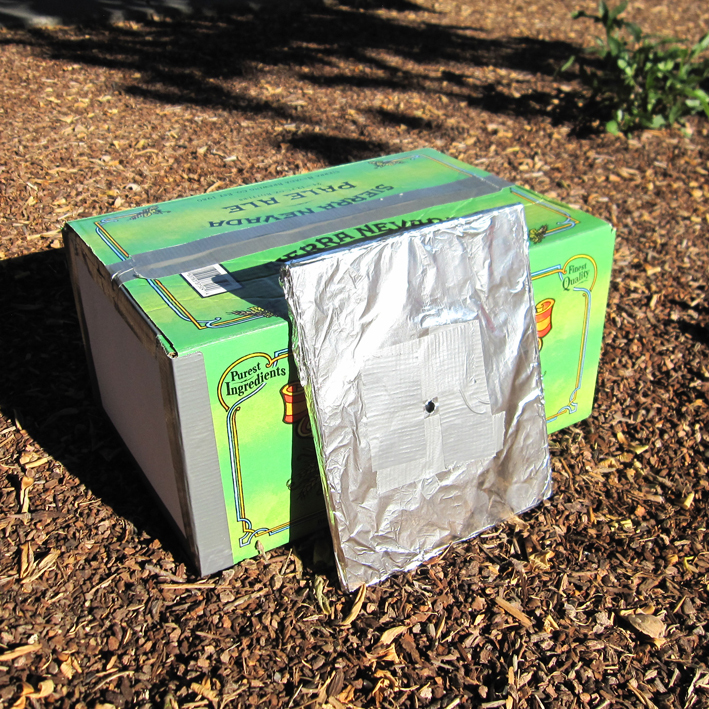 One end I covered with a sheet of foil through which I poked pinholes. At the other end I taped a sheet of white paper to serve as a rear-projection screen. The back end of my pinhole telescope, showing four tiny crescent Suns (because I poked four holes in the other end of the box) back-projected onto a sheet of regular paper. We just sat there and watched the wall. As you can see in the photos, even with the Sun 91% covered it never got dark. It definitely got darker, with the light and shadows taking on a quality I can only describe as eerie, but someone unaware of the eclipse probably wouldn't have noticed at all. Then when the Sun went down and it got windy and cold, I picked up my telescopes and went home. Perfect. I might've felt more urgency to witness the full annular eclipse if I hadn't already had the ultimate total eclipse experience on February 26, 1979. That one covered the Sun completely and swept across the Pacific Northwest; I was in my freshman year of college and determined to see it. At the same time, I had a friend who was a big train buff. Ed knew all about their history, routes, lines, station architecture, everything. He theorized that we could board Amtrak's northbound Coast Starlight holding a cheap ticket to the very next station and then ... just not get off. Move around, avoid conductors, act casual. He was sure it would work, and the very worst that would happen if we were discovered is we'd get kicked off. And I'll be darned: it worked. After a long night huddled in the observation car, we (our merry band of adventurers had grown to five) detrained in Portland, Oregon, which on February 26, 1979 turned out to be the only spot in the Northwest completely covered in clouds. We nevertheless rose early the next day to find a bluff overlooking the Willamatte River to watch the Sun disappear. Even though we couldn't see the Sun through the clouds, even though we understood precisely what was happening, it was one of the most remarkable, chilling experiences of my life. As the still of sudden nighttime swept across Portland like God drawing a curtain--as the birds stopped chirping and the streetlights blinked on below us--I knew deep in my gut why my ancestors were so terrified they prayed to the giant sky dragon to disgorge the Sun and set things right. Every biochemical cycle in my body that evolved through millions of years of days and nights, moonrises and moonsets, seasons and years, down to the cellular level, screamed out "This is wrong!" It was frightening, exhilarating, and disturbingly weird. The coda to the story is that we successfully used our train-hopping trick to return home. The funny part is that we saw all the same people in the observation car going south as we had going north. The train both ways was full of freeloaders who'd had the same idea. So I was TAing Introductory Astronomy when a student came to see me during office hours. Several weeks into the class, she needed some help understanding eclipses. No problem, that's why I'm there! We worked on it a long time, with me drawing every diagram of the Earth, Sun and Moon I could think of, and it just wasn't clicking for her. Nothing I did could erase the sad, puzzled look from her face. I began to think I was the worst TA ever. And then, after maybe 20 minutes, she lit up. "Oh!" she exclaimed. "Do you mean that the Sun is farther away than the Moon?" That was the problem. She couldn't understand why the Sun and Moon never ran into each other. Sometimes I like to think my work as both a science writer and graphic novelist is a tiny antidote. Speaking of higher education, last weekend my daughter Robin earned her Masters Degree in Archaeology, and Karen and I couldn't be prouder. She wrote an impressive thesis and has already done some good work in the field and lab, and we're confident she has the skills and contacts to make a go of it. She worked very hard and we're very happy for her. Congratulations, Sweetie! 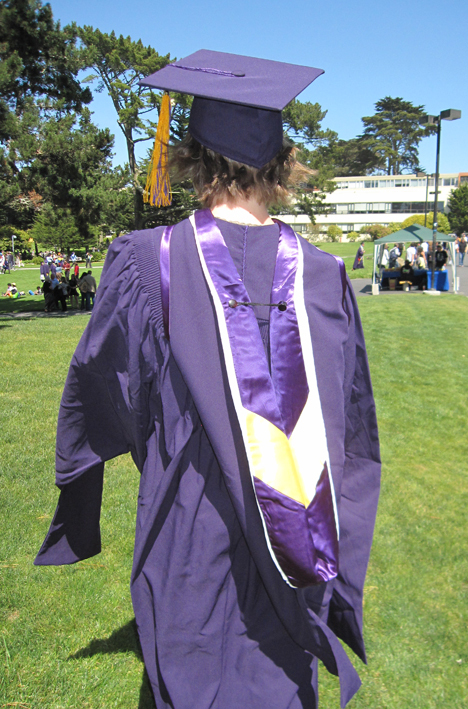 Rather than embarrass Robin by posting the traditional posed snapshot, which would mortify her, I thought I'd use this one showing her Master's hood and floppy-sleeved gown. I just noticed as I uploaded this photo that I unthinkingly labeled it "Robin Hood." Somehow we went 24 years without making that joke. Brian, this is wonderful. I poked a hole in a folded over piece of paper and got a similar effect but it wasn't a cool as yours. I, too, took pictures of the crescents on the outer wall of the house. Soooo much good stuff to comment on in this! Our yard was completely in shadow when the eclipse was at its height, so I went into town (such as it is) where the east side of the main drag, highway 9, was in full sun. The dapples were outstanding from the little trees that have been planted along the sidewalk there recently: here by patrons of Joe's Bar and here fluttering around the water company office. Concerning college students' misconceptions: have you ever seen the 1980s short documentary, filmed at a Harvard commencement, called "A Private Universe"? Robin: Yay! And don't worry about "Robin Hood" jokes. Even if they catch on for a while, you'll ultimately learn to ignore them. Take it from a guy named Sherwood. Marion, thanks! The dappled light through leaves really is the best "trick" an eclipse performs, I think. Sherwood, I wrote with you in mind and am glad you saw it. Thanks for the links. I never saw "A Private Universe" and am not sure I want to--it sounds depressing. But I'll file it away. Robin and Sherwood...sounds like a film title. Funny connection! There's the age difference. I've got a picture from that 1979 eclipse, but it's of six-year-old son holding the pinhole camera while his three-year-old brother looks on in amazement. Said little brother now has his own three-year-old to astonish. It's been a couple of years since his older brother had a six-year-old around the place. Well, there's also the fact that, when I studied cosmology, it had to do with spheres-with-spheres, what revolved around which and how you figured the necessary epicycles. But I think that has more to do with changes in language than in the science itself. By the end of the course, we'd pretty much committed to the whole Copernican model, though we were divided on puddingstones and such. Great pictures of the eclipse, Brian! We also had an eclipse-watching party, and had both a welder's helmet and a paper plate with a hole in it. 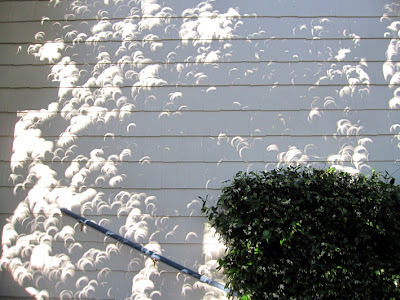 But as you said, the pinhole projections from the trees were the most impressive. Here's my shot of that effect. Mike, all I know is it's turtles all the way down. Tim, that's a great picture! If those were my kids, I'd blow it up and hang it in the family room. Nice. Tim's picture is so great that I might blow it up and hang it in our family room even though I've never met Tim or his kids. Love the "pinhole cameras" in the tree! That's a remarkable picture!